Problem solving skill is the core of mathematics education and its importance cannot be denied. This study specifically examined 56 freshmen pre-service mathematics teachers’ problem solving processes on a specific problem with the help of Geometer’s Sketchpad (GSP). They were grouped into two-person teams to solve a problem called "the mirror problem". They were expected to solve it by means of GSP. According to their works on GSP and related reflections, there appeared two different solution methods for the problem. However, the results of the study revealed that pre-service teachers could not visualize the problem in their mind and apply it to GSP. More generally, they found the problem hard to solve. They experienced difficulty in transferring the static drawings into dynamic environment and in observing the manipulations on GSP. Awofala, A. O. A. (2014). Examining personalization of instruction, attitudes towards and achievement in mathematics word problems among Nigerian senior secondary school students. 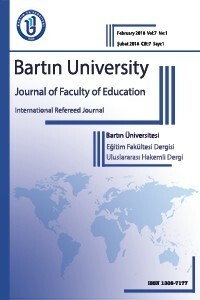 International Journal of Education in Mathematics, Science and Technology, 2(4), 273-288. Baki, A. (2008). Kuramdan uygulamaya matematik eğitimi. Harf Yayınları: Ankara. Chapman, O. (1999). Inservice teacher development in mathematical problem solving. Journal of Mathematics Teacher Education, 2, 121–142. Creswell, J. W. (2007) Qualitative enquiry and research design: Choosing among five approaches, Thousand Oaks, CA: Sage Publications. Dimakos, G. & Zaraniz, N. (2010). The influence of the Geometer’s Sketchpad on the geometry achievement os Greek school students. The Teaching of Mathematics, 8(2), 113-124. Engin, A. O., Tösten, R., & Kaya, M. D. (2010). Bilgisayar destekli eğitim. Journal of Institute of Social Sciences, 5, 69-80. Eu, L. K. (2013). Impact of Geometer’s Skechpad on students’ achievement in graph functions. The Malaysian Online Journal of Educational Technology, 2(1), 19-33. Kayan, F., & Çakıroğlu, E. (2008). İlköğretim matematik öğretmen adaylarının matematiksel problem çözmeye yönelik inançları. Hacettepe Üniversitesi Eğitim Fakültesi Dergisi, 35, 218-226. Kerrigan, J. (2002). Powerful software to enhance the elementary school mathematics program. Teaching Children Mathematics, 8(6), 364-348. Kin, C. W. (2003). A comparative study of from 4 students’ problem solving strategies with or without using geometer’s sketchpad. Unpublished Master Thesis, The University of Hong Kong, Hong Kong. Koyuncu, İ, Akyüz, D., & Çakıroğlu, E. (2015). Investigating plane geometry problem-solving strategies of prospective mathematics teachers in technology and paper-and-pencil environments. International Journal of Science and Mathematics Education, 13(4), 837-862. Laborde, C., Kynigos, C., Hollebrands, K., & Strässer, R. (2006). Teaching and learning geometry with technology. In A. Guttierrez & P. Boero (Eds. ), Handbook of research on the psychology of mathematics education: Past, present and future (pp. 275-304), The Netherlands: Sences Publishers. Lesh, R., & Zawojewski, J. S. (2007). Problem solving and modeling. In F. K. Lester (Ed. ), Handbook of research on mathematics teaching and learning (2nd ed., pp. 763-804). Charlotte, NC: Information Age. McMillan, J. H., & Schumacher, S. (2006). Research in education: Evidence based inquiry (6th ed.). Boston: Pearson. National Council of Teachers of Mathematics (2005). Technology supported mathematics learning environments. Reston, VA: Author. O’Donnell, A. (2011). Using Geometer’s Sketchpad to Improve Student Attitude in the Mathematics Classroom. Unpublished doctoral dissertation, College of Arts and Sciences, Minot State University, ND. Silver, E. A. (1994). On mathematical problem posing. For the Learning of Mathematics, 14(1), 19–28. Wilson, J. W., Fernandez, M. L., & Hadaway, N. (1993). Mathematical problem solving. In P. S. Wilson (Ed. ), Research ideas for the classroom: High school mathematics (pp. 57-77). New York: Macmillan. Yavuz, G., Arslan, Ç., & Gülten, D. C. (2010). The perceived problem solving skills of primary mathematics and primary social sciences prospective teachers. Procedia Social and Behavioral Sciences, 2(2), 1630–1635. Yıldırım, A. & Şimşek, H. (2008). Sosyal bilimlerde nitel araştırma yöntemleri (7th ed.). Ankara: Seçkin Yayınları. Yiğit, M. (2014). A review of the literature: How pre-service mathematics teachers develop their technological, pedagogical, and content knowledge. International Journal of Education in Mathematics, Science and Technology, 2(1), 26-35.